When you think of Nature, Manly Men, Hikes and combine them... you can create a manly-man Nature Inspired Card for a Birthday Celebration!! This fun and easy card pulls together with the inspiration of wood and trees, tied together with the a rough rope Natural Linen Thread (#104199). Our awesome Natural Composition Specialty Designer Series Paper (#126917) has wonderful shiny raised printed patterns on a heavy-weight paper. 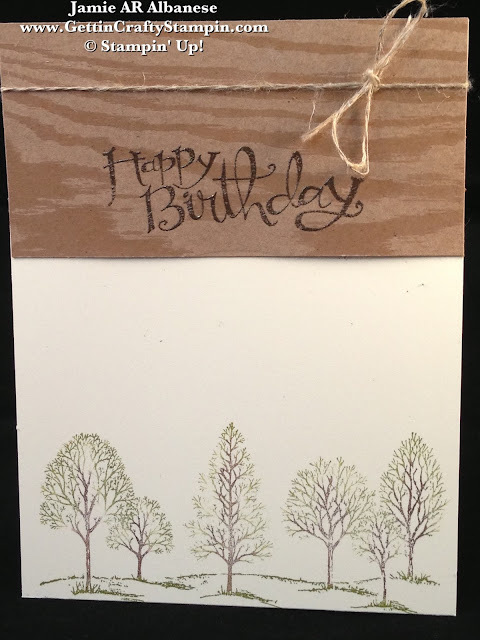 This natural wood print is the perfect accent for this Lovely as a Tree stamped birthday card. Very Vanilla card stock (#101650) makes for a clean base. I think, if most men are like my husband, less is more - lol.... he likes it clean and simple (my Daddy used to say KISS - Keep It Simple S... illy - lol). Stamping this Sassy Salutations (#126707) Happy Birthday with Versa Mark (#102283) and cover with Early Espresso Embossing Powder (#128980). Heat Set with our Heat Tool (#129053) on this Natural Wood printed page. It has a real feel of wood, too! With our Garden Green Stampin' Write Marker (#131262 for the Regals Collection of Stampin' Write Markers) you can paint the grass and leaves on the tree to this card. 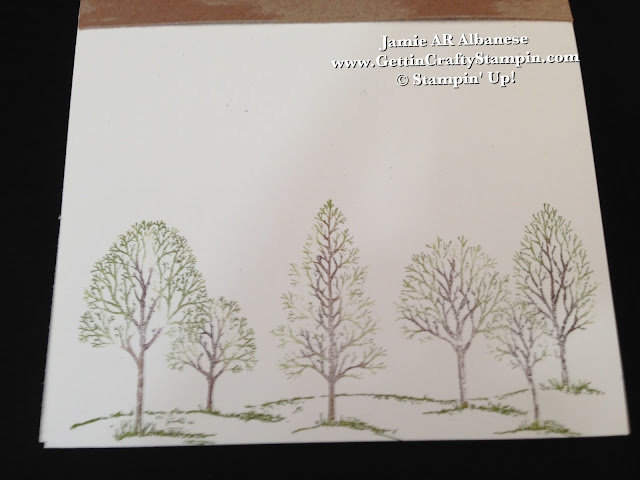 Using the Early Espresso Stampin' Write Marker (#119680) to color the tree trunks in. I adore this Lovely as a Tree stamp set (#127793) - it's perfect for every season, nature lovers, holidays, fairy birthdays... oh, it's so lovely! Natural, simple, celebratory wishes for a simple man and friend to our family. Who would YOU gift this to? Leave me a comment and let me know! Share, Pin, Email, Facebook, Tweet... and FOLLOW Me on those avenues in life - on YouTube, LinkedIn and more!! 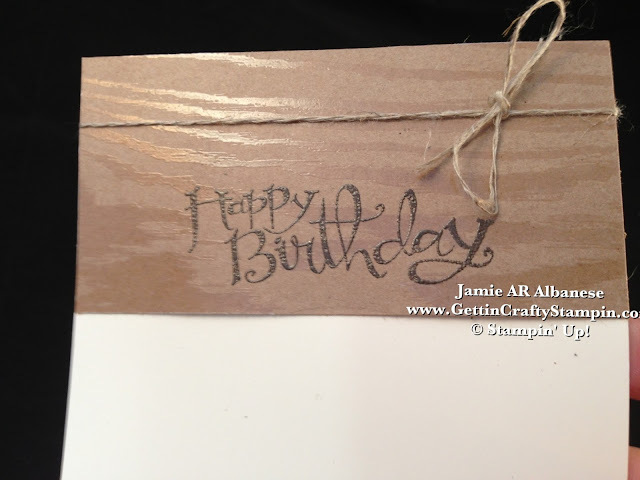 Want MORE of Gettin' Crafty Stampin'?? Join my Exclusive Mailing List, Gettin' Crafty Stampin' Virtual Club, Classes and more! Think Nature, Manly Men, Hikes and combine them for this fun card. 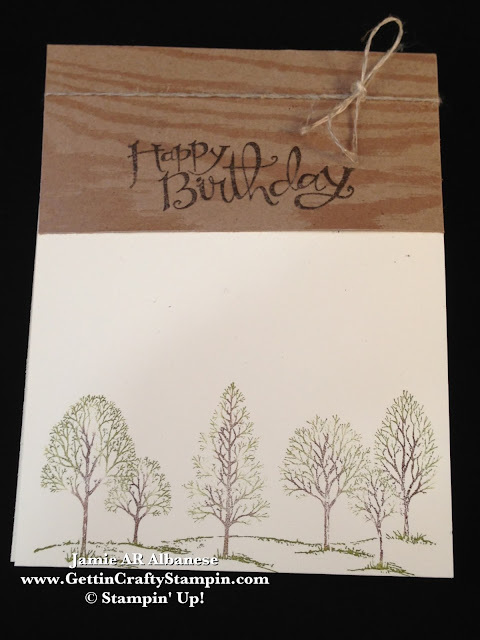 Join me in creating Manly, Nature Inspired Card for a Birthday Celebration!! Like with nature - keep it warm, simple and elegant.